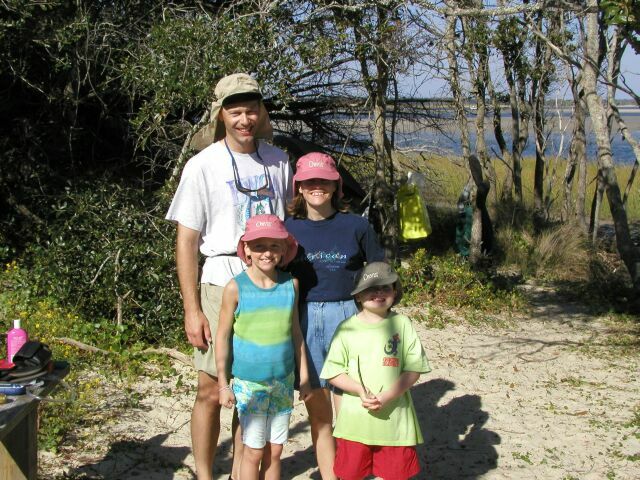 Scrub, brush, marsh, and bugs...it's Campsite 13! 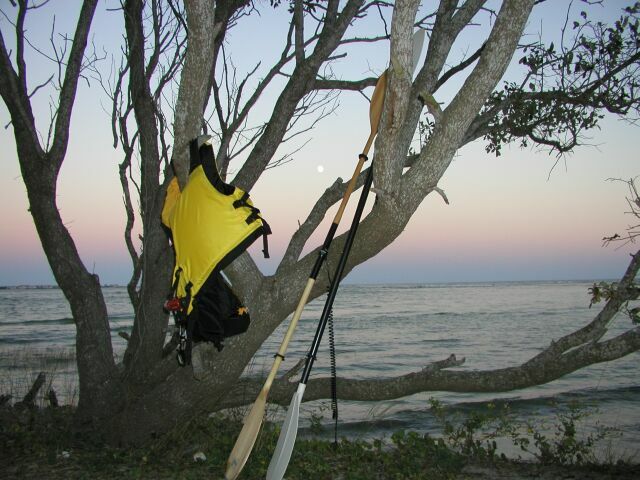 "I have a dream..." I'm going to paddle solo from the mainland to Ocracoke Island next Summer. This will be about 29 miles and I will need two days to make it, camping on Portsmouth Island for the night. I'll put in at Atlantic, near the Cedar Island Ferry, and then cross to the inland side of Portsmouth Island. I'll then make my way North with the tide and camp for the night. 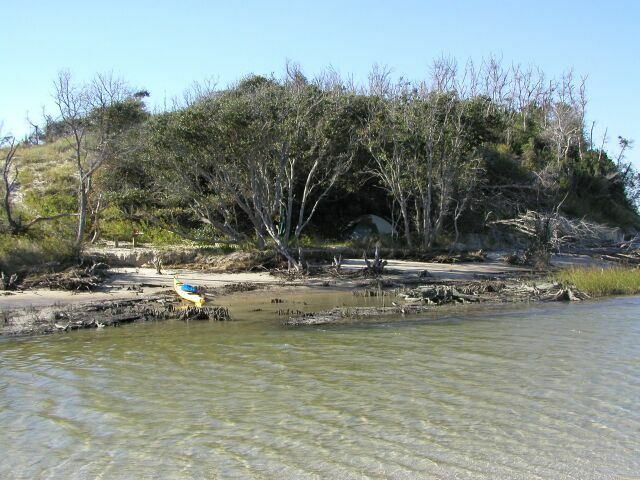 The next day, I'll continue with the tide and cross the Ocracoke Inlet to land at Silver Lake. In this way, I will never be too far from land and will be able to get ashore if a problem comes up. To prepare for this paddle, I'm working with the Cape Horn and trying out kayak camping. 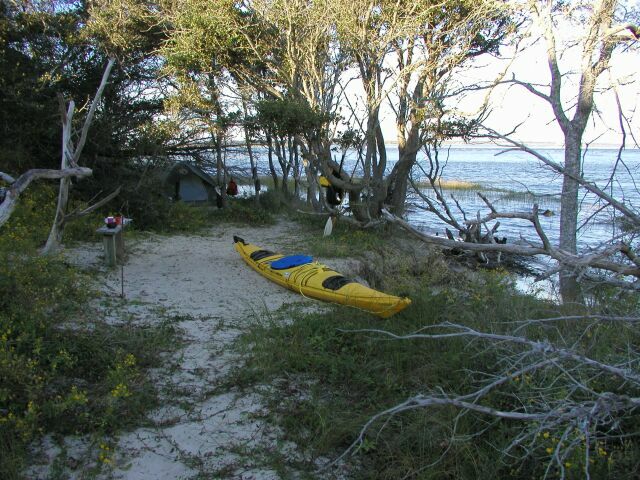 I decided to paddle out to Bear Island at Hammocks Beach State Park to spend a couple nights. The first weekend I had planned for the trip was rained out, so I changed my plans and ended up spending my birthday camping solo on the beach. 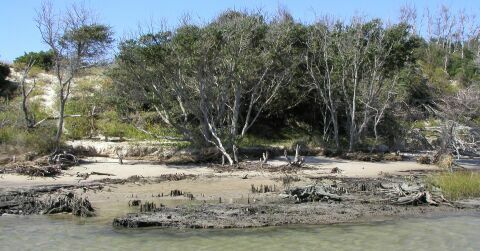 I put in at the park ramp on the mainland and followed the canoe/kayak trail through the estuary to the island, a distance of a little less than 3 miles. (Due to superior planning and scheduling, I was going against the tide.) At first I was a little disappointed by the site, but it soon grew on me. Unlike the other sites, I had no campers to either side of me. I also had some of the only shade on the island. 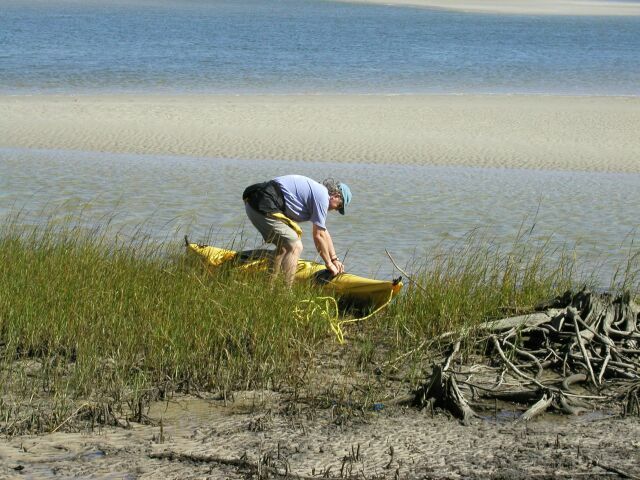 The view was magnificent and I was right at the water's edge, which made it much easier to load and unload the yak. The results of my camping were a mixed lot. Most of the equipment worked great. The Coleman Sundome tent was a dream...it went up fast and was very roomy at 9' X 7'. 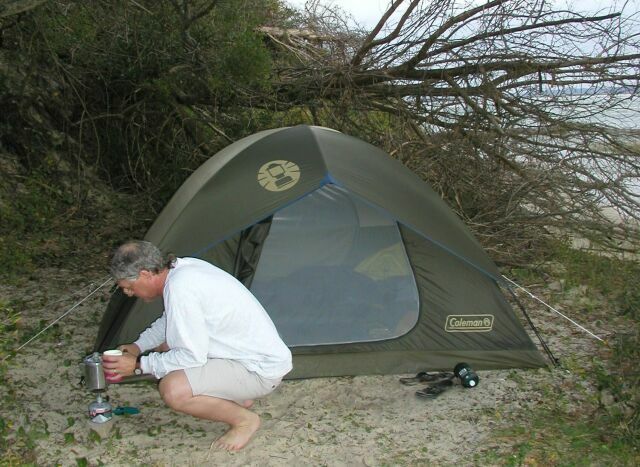 The Primus stove did a great job and I used less than a single container of fuel. The Platypus water carriers were tough and allowed me to pack water in odd spaces in the yak. (I took way too much fuel, water, clothes, and food.) The MREs I tried out at one meal were not bad at all. They were much better than the K-rations I ate sometimes as a Boy Scout. Perhaps the biggest disappointment was my sleeping bag. I've tried several bags, but I just can't seem to find one that is big enough for me and that will still compress small enough to get it through my bulkhead hatches. I tried a High Peak synthetic fill mummy bag on this trip and spent two terrible nights in a too-small bag. When I got back, I went to REI and got a long REI Syn-Cat bag and compression sack. No more screwing around with cheap K-Mart or Target bags! This thing is like a big comforter. I'm just landing in the marshy area and getting ready to unload my gear. The Cape Horn performed flawlessly. Doesn't look like much, even after it's set up, does it? This is probably the only site with any shade...and it's private. Full Moon with Paddles, Spray Skirt, and Life Vest seems like a good title for this one. Taken the first night out. I met the Smith's paddling out. They came to my camp on Saturday bringing a muffin and a match to serve as a birthday cake. 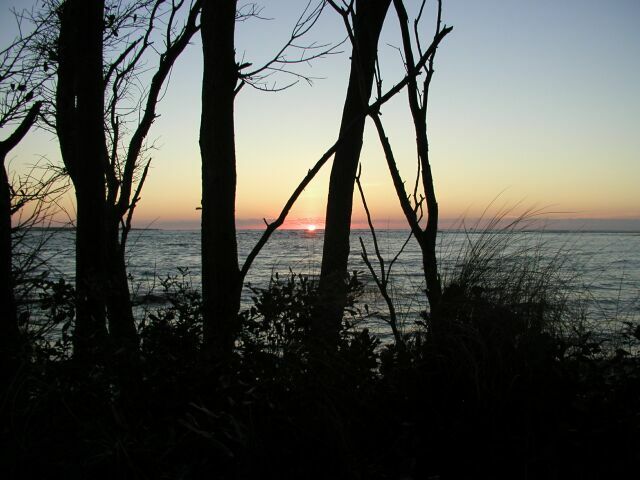 A counterpoint to the beautiful full moon - sunrise seen from the tent. The view from this campsite was just great. Making coffee with a Primus butane/propane stove. It's amazing how fast you can boil water with this little gadget. OK, the cigars are bad for me, but they keep the gnats away when the wind's down. And the whiskey in the coffee kills 'em, too. All in all, a very worthwhile trip. I gained some valuable experience in packing the yak and in maneuvering it with an extra 50 lbs. of cargo. I got to practice some navigational skills with compass and GPS. I even resolved some problems with packing my safety equipment (marine radio, aerial flares, smoke flares, boat horn, signal mirror, etc.) and spare paddle (you do carry a spare paddle, don't you?) 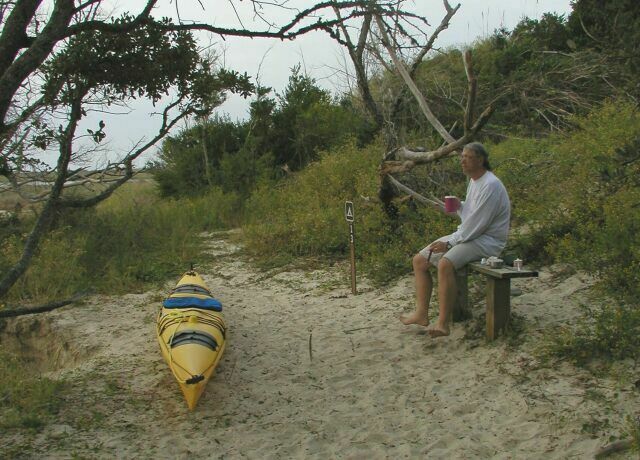 I'll be trying this again in the Spring, maybe paddling out to Portsmouth Island and back again over a weekend. Drop me a note if you want to discuss any aspect of this page or if you have advice or suggestions. Please don't ask me any difficult technical questions about kayaking, camping, or digital photography, because (1) I don't necessarily know what I'm doing, and (2) when I know what I'm doing, I still probably don't know the best way.